Cholmondeley Pageant of Power asked us to return after a five year break. We thoroughly enjoyed our original appearance in 2008 so we were looking forward to the return. As with all these things the logistics can be quite interesting as the day jobs tend to complicate the proceedings. We were asked to set up the shop on the Thursday for the preview day on the Friday. First problem was getting the motor home down with the trailer as I was working until 7pm in Salford. So Jo and Nina set off from Wesham to meet up with me at Lymm Services. It was decided it was worth taking the Jeep as it would give us the ability to move the trailer around into position rather than having to use the motor home to do so. It also meant that those staying in more palatial accommodation had transport, and we had a means of picking up Andrew Harvey (Loach Pilot) on the Sunday. We duly met up at 19.30hrs and headed off to Cholmondeley which got us there in good time to set up the awning - unfortunately there was a little uncertainty as to which spot we had been allocated. After about 45 minutes we were directed back in through another entrance. Our allotted spot was some 100 yards from where we had been in 2008. We were on the edge of the Lifestyle Park where the traders were. The three of us chose our spot and set about putting the awning up. By this time it was late and the light was failing fast. With a drink at hand we managed to get the thing sorted - the latter stages being done with the aid of torches. Pleased with our efforts we sat down for a bite to eat. 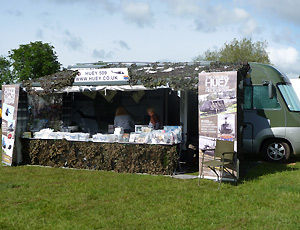 We were up and about reasonably early as the gates opened to the public and we had yet to set the shop up. The numbers coming through the gate were very respectable. The most frequently asked question of the day was the arrival time of the Huey. All day we kept in touch with base to check their departure time as the weather was not being particularly kind to us. The weather we had at Cholmondeley was reaching Wesham an hour later. As a result the time of arrival was constantly changing. I had been up to the landing site to talk to the guys in charge just to let them know the situation. 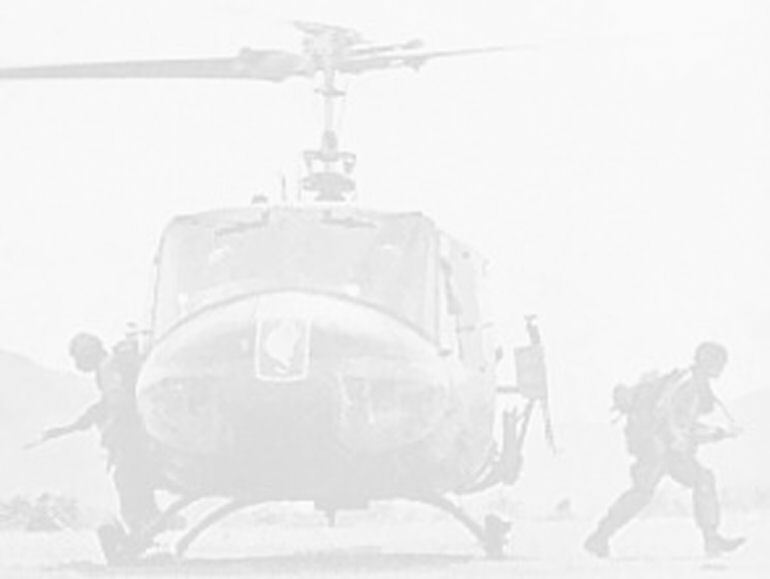 By two o'clock the flying crew of Rob, Phil, Bradley and Oliver were all assembled at the hangar, and the Huey and the Loach were wheeled out. But the weather was not looking good. The estimated arrival time was 15.30hrs but it soon become obvious that this was not going to be realistic. As 15.30hrs came and went there were a few long faces. It was then decided to see how the weather was for an arrival of around 17.30hrs. We were getting near to the closing time of the landing zone but the guys on duty said that a later arrival wasn't a problem for them (thanks to Lee and his team at Heli-support). With this information it was decided that we would wait a little longer. Rain clouds came and went over Cholmondeley and headed north. The cloud base had risen which was in our favour and so it was decided that the Huey and the Loach would lift. Their flight south proved to be harder than we had anticipated but at 19.45hrs they were spotted low and to the north east of us heading from the low level corridor that allows aircraft to transit between the air space of Liverpool and Manchester airports. Two suitable areas had been chosen for the two aircraft. I marked the Huey spot and Jo the Loach's. Rob flying the Huey headed for me and Phil flying the Loach made a beeline for Jo. Both safely on the ground we secured them for the night and everyone headed for the shop. I in the meantime had gone to get the Jeep to carry all their bags for them. By the time I had negotiated around the site they had set off. After our meal we had a wander around the site to have a look at the incredible array of expensive machinery on display in the paddock. The girls headed off to the hotel while the rest of us sorted out the accommodation in the motor home. Saturday dawned much brighter than the day before which was a relief. Jo and Nina returned to set up shop and a few of us headed off to the aircraft the sort things out. 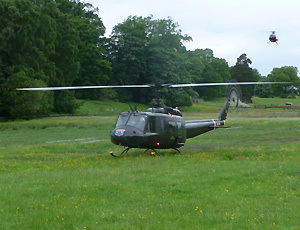 Only the Huey was displaying on the Saturday so Rob set about his 'A' checks to make sure everything was ok for flying. Trade at the shop was slow but plenty of people stopped for a chat and to find out where the helicopters were parked. A little after two and we made the final checks and Rob climb into 509 and strapped her on. By this time quite a crowd had assembled by the fence to see her take off for the display. Rotors untied and pulled round to the 3/9 o'clock position Rob pressed the starter but nothing happened. Another look around to check everything and the starter was pressed. This time the igniters started ticking and the starter motor started to strain. The turbine whined and a cloud of smoked emerged from the exhaust, the turbine now began to take the strain and helped the starter. The blades began to move. The power and the speed picked up to the point where the starter was released and the turbine was doing all the work. Rob continued to monitor the aircraft as he waited for the instructions to lift to do his display. He was burning and turning for about seven minutes. He nodded so we knew he was about to lift. The sounds of the rotors began to change as he pulled in some pitch and the blade began to dig deep. 509 broke her ties with the ground as she rose into the sky. Rob backed up fifty feet or so before turning the aircraft around to fly out north to set himself up for the run in to the display area just the south of the race track. Rob twisted and turned, corkscrewed and climbed around the display area whilst at the same time keeping the noise levels high. He had said he would try and drown out the racing cars running round the track below. He did a pretty good job of it as well. The crowds around the site were certainly making the most of the spectacle all around them. Unfortunately we couldn't let them get close to the Huey and the Loach as they were parked where the helicopter pleasure flights were flying from. After the gates had shut we had a bite to eat and headed up to the stage where the Manchester Camerata were giving a classical concert with an aviation theme. One particular piece attracted our attention, the Ride of the Valkyries. 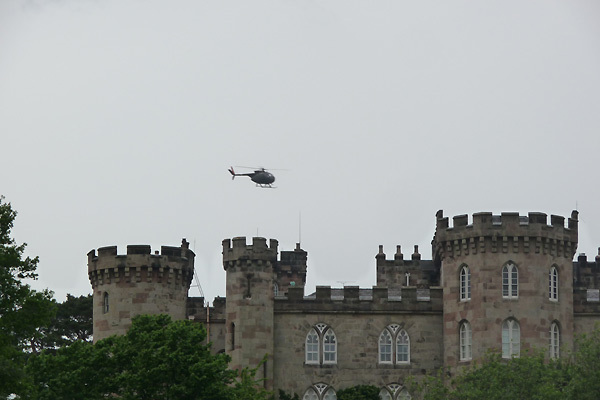 We'd heard that a couple of Squirrel helicopters from RAF Shawbury were going to appear from behind the stage and split left and right during the performance. Their timing was spot on, but the sound just wasn't right.......now where could they get the right sound from, with guns blazing, hmmmmmm? After a great night with Cholmondeley Castle all lit up we headed for some much needed sleep. Sunday morning up early and we got ourselves ready for the second day. We were also sorting out getting Andrew Harvey in to the show ground as he was to be the Loach display pilot. Andrew has been working with Phil for some time with the Loach but this was to be his inaugural display in 011. 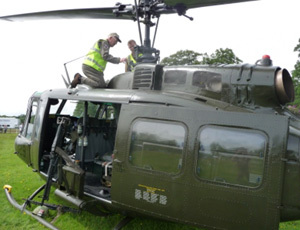 Rob had pre-flighted the Huey and on his arrival Andrew checked over the Loach. Andrew was to display first so he climbed in and fired up the Loach. On receiving his instruction to lift, the Loach leapt into the sky, turned swiftly north and scooted off. Andrew made the Little Bird dance around the sky doing things we had never seen the Loach let alone any other helicopter do. It was an unbelievable sight. It certainly made us realise just how nimble an aircraft the OH6 really is. Andrew returned the Loach to the landing site with a deftness of touch. 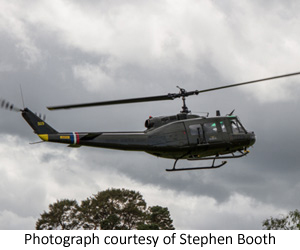 It was Rob's turn in the Huey again and he too did not disappoint with his display which does show 509 off to her best, with of course the compulsory beating of the air into submission. 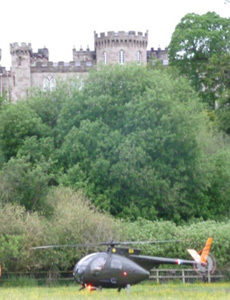 Not long after that we started to prepare both helicopters for their return flight to Wesham. 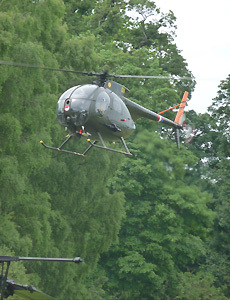 All kit and equipment needed for a swift exit was packed into the two helicopters. After the gates were closed to the public the shop was packed away and the awning taken down and trailer attached to the motor home. With that we headed back up to the helicopters to watch them depart. Andrew and Phil in the Loach and Rob and Brad in the Huey. Nina and Oliver headed off in the Jeep and Jo and I trundled back to Wesham in the motor home. Another thoroughly enjoyable weekend and a great way to show off the two aircraft, though we couldn't get as many people as we would have liked up close and personal with the machines. The concert on the Saturday night was great, we particularly enjoyed ‘Ride of the Valkyries’, but if we could be so bold to suggest an improvement?! !